“What explains what?” I ask. I am going to gather she stopped short at that point, less because her brain kicked in and more because I’m sure my expression went from amicable to apoplectic by the second syllable of the classic “A” word used with well-spoken blacks: Articulate. Was it because I did not interject “like” and/or “you know” every fifth word or so? Perhaps it was my lack of “neck roll”? I don’t know, but I’m pretty sure I popped a capillary in my efforts to restrain my disbelief at hearing this. Worse, I am hearing it from someone less than 30 years of age who damn sure should know better considering this nation has been led by a black president these past five years. Political party differences aside, our nation is not in the habit of electing those who cannot properly conjugate a verb. Clearly, Barack Obama is an ethic fluke, as this is not the same English spoken by the majority of educated people in this country. “I mean, I mean….” She starts the familiar back-peddle seen often when people are caught hoisted on their own petard. It perpetrates the stereotypes that blacks speak mostly in slang, in Ebonics, in anything other than standardized English. It is divisive, separating us into an “us” and “them”. It is the stereotype is perpetrated within less affluent black communities every time a well-spoken black person is accused of “talking white”. The stereotype that equates articulate styles of speech as belonging to “white” rather than belonging to “intelligence”, as though one was still the exclusive dominion of the other. Blacks do not assume every white person has a major in English, why is it still a thing of note to some when encountering those of us who have proper command of diction and enunciation? Here we were in 2014 Anno Domini and yes, this is still a conversation that needs to be had. 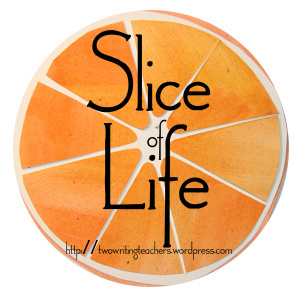 Check out more of today’s slices of conversation at Two Writing Teachers. I’m starting three days of days late, so you’re not too late to join in yourself. Come on in, the slicing’s fine! hmm… While you certainly have every right to believe and feel the way you do, I will offer up my personal observation that the only time I’ve ever complimented someone as ‘being articulate’, it had everything to do with what they read and said and not the color of their skin. I know many people of all skin colors that cannot frame a sentence without resorting to slang, contractions, or otherwise mangling the rules of grammar. But in the handful of times I’ve remarked that so-and-so ‘was articulate’, it was as a reflection of their having been exposed to and taken notice of the writing styles of many authors beyond those that can only be found at the checkout counter of my local food store, and leveraged those skills in to a mastery of discourse and conversation. I’m not attempting to make light of what you perceive as a slight against you, but at same time cannot help but wonder if you missed out on accepting what may have been a genuine compliment of your choice of reading matter and its effect on you. Many people can read the classics or more worthy material without having the skillful aspects of language and word choice rub off on their daily lives. You, quite honestly, are erudite, well-read, and (dare I say) articulate. And you would be so as an Asian, Indian or Caucasian woman just as much, because of who you are, not how you appear. Here’s the thing, JJ, my preconceived notion is that everyone I chose to converse with will be articulate until proven otherwise. Yes, I am proven otherwise far too often across the racial spectrum, but I am not surprised by it, I adjust accordingly. Please note, that this exchange early occurred Saturday morning. Having slept on it and having a few hours perspective away from my initial reaction, I did think about that “what if..” the entire time I was writing this. I held off on it until today before I made the decision to post it. It is something I do, take a mental step back, whenever I have such a strong reaction to anything in the black/white relations sphere because I am very conscious of the negative crap spoon fed to me growing up and I strive to not let it color my judgements. However, I have been in this situation with total strangers before and not have such a strong reaction as I did to her. Maybe it was gut instinct, maybe it was overreaction, I’ll never really know, will I? It may be personal vanity, but at fifty spins around El Sol, I like to think I have become a little better at discerning which is which. It was something about her, about the way it was said that made me really feel I called it correctly on this particular one. Today is National Grammar Day and I ain’t know nuttin’ ’bout wha choo be talkin’!